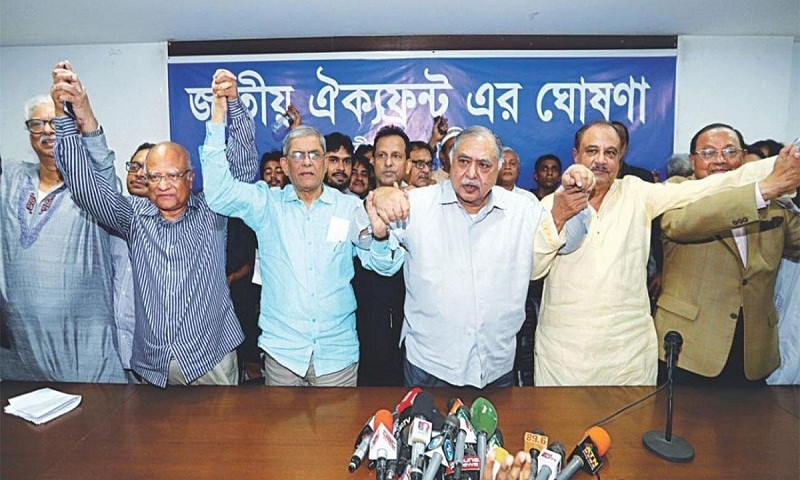 Dr Kamal Hossain’s Gano Forum is now planning to mount pressure on BNP to sever its ties with Bangladesh Jamaat-e-Islami to keep the Jatiya Oikyafront intact and launch a movement together with like-minded parties demanding a fresh national election. Talking to UNB, some Gano Forum leaders have said they want to strengthen the Jatiya Oikyafront in such a way so that no one can malign the alliance for Jamaat and BNP acting Chairman Tarique Rahman. They also said some left and right parties are contacting them to join the newly launched coalition, but they are giving a condition that BNP must part its ways with Jamaat. The Gano Forum leaders also said they think their two MPs and BNP’s six should join parliament since they won their respective seats fairly ‘unlike many others’. Under the circumstances, Gano Forum central committee is going to sit in a crucial meeting on Saturday to assess the December-30 national election and decide the future of its alliance with BNP. The meeting that will begin at 10am at the party’s Arambagh central office will also work out the party’s next course of action, Gano forum media wing member Latiful Bari Hamim told UNB on Friday. Party President Dr Kamal Hossain will preside over the meeting and hold a press briefing at 4pm. Contacted, party central committee member Amin Afsari said they will take various important decisions at the meeting about the future of their party’s alliance with BNP and some other parties and their future action plans. He said they will also discuss whether Jatiya Oikyafront can be strengthened through involving some other left and democratic parties. Afsari also said their party may seek opinions of their central committee members whether their party’s two elected MPs should take oath or not. Party training affairs secretary Rafiqul Islam Pathik said their meeting will evaluate the just-held national election and take decision to strengthen their party’s organisational capability to launch an anti-government movement. About Oikyafront, he said some parties, including both the left and right ones, are eager to join the coalition to wage a movement demanding a fresh national election. He said if BNP does not accept their decision, they may try to reshape Oikyafront with other like-minded parties. Dr Zafrullah Chowdhury, Gonoshasthya Kendra founder who played a vital role in forming the Jatiya Oikyafront, said BNP should leave Jamaat in the interests of its own as well as Oikyafront. He said BNP should now first boost its organisational strength to stage a comeback alongside making its ties with Oikyafront alliance partners stronger further.